This product is a non-selective herbicide that will kill all vegetation contacted. It enters plants through the leaves and moves down to the roots. This will ensure that the entire plant is killed. Avoid direct spray or drift onto desirable plants, lawn grasses, shrubs and trees. Protect desirable plants and vegetation with a piece of plastic or cardboard. If desirable plants are accidentally sprayed, wash plants with water immediately. Do not apply this product in a way that will contact any person or pet, either directly or through drift. Keep people and pets out of the area during application. Do not mow for seven days before or after treatment. Do not make more than two applications per year to any given area. Use this product to kill the old lawn and existing weeds and grasses. For best results, apply in spring or fall when daytime temperatures are at least 60°F. 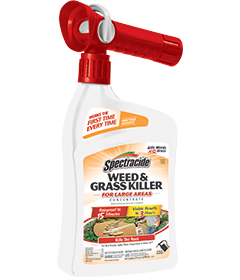 If the lawn is dry, water lawn every other day for a week before applying Spectracide® Weed & Grass Killer For Large Areas Concentrate. Determine the size of the spraying job. This container will treat 1,350 sq ft as part of a lawn renovation/replacement program. WARNING. Causes skin irritation. Causes moderate eye irritation. Do not get on skin or clothing. Avoid contact with eyes. Wear chemical-resistant gloves made out of any waterproof material. Wash thoroughly with soap and water after handling and before eating, drinking, chewing gum, using tobacco or using the toilet. Remove and wash contaminated clothing before reuse. Pesticide Storage: Store this product only in its original container in a secure storage area away from sources of heat or open flame. Protect product from freezing. Pesticide Disposal and Container Handling: Nonrefillable container. Do not reuse or refill this container.